When sAsthras talk about the types of karmas, it classifies them into three types namely; past karmas, present karmas and future karmas. In the previous pAsuram (#23), svAmi aruLALa perumAL emberumAnAr focused on past karmas. In this pAsuram though,he talks about the present karmas. He tries to console the heart that is saddened due to the thought of committing a lot of karmas. He goes ahead and says that srIman nArAyaNan would not pay any heed to the karmas that HIS true devotees perform without their conscience. He will see those karmas of them but would just dismiss as if HE did not see anything. vaNdu padi thuLaba mArbinidaich seydha pizhai: The bad karmas that are done towards perumAL srIman nArAyaNan who adorns a beautiful thiruthuzhAi garland that attracts a number of honeybees that come to drink the nectar in it. We may get a question here as to why does svAmi aruLALa perumAL emberumAnAr describe perumAL as the ONE who has the beautiful thiruthuzhAi garland. The reason is that HE always shows HIMSELF as beautiful to those who had taken refuge at HIS lotus feet. They will want to be immersed in HIS beauty always. Once they have surrendered unto HIM, they will never commit anything that is deemed “bad”. Even if they had committed them unknowingly, HE would not pay any heed to them. HE would want them to enjoy HIS beauty once they have surrendered unto HIM. It is to illustrate this fact that HE adorns HIMSELF beautifully with a thiruthuzhAi garland. uNdu pala enRu – Even when one had done total surrender unto srIman nArAyaNan, because of his body that is being controlled by the five senses, there are umpteen chances to commit mistakes. It is said in thirukuRaL that “uran endRum thOtiyAl Or aindhum kAppAn”. This is a comparison wherein the five senses are compared to an elephant and the mind as the controlling stick. It is extremely difficult to control the senses. svAmi thirumangai AzhvAr says, “aivar aRuthu thindRida anji nin adaindhEn”. svAmi nammAzhvAr says “uNNilAviya aivarAl kumaithItRi”. Hence we can understand that because of these five senses thare are innumerable opportunities for one to commit mistakes even after performing saraNAgathi, due to the association of those senses with the body. When this happens, the person’s mind starts to tremble at the grave mistakes he had committed. uLam thaLarEl: To such a mind, this phrase offers consolation in the form of “Hey mind! Do not worry and do not tremble!!! The word “uLam” is a shrunken version of “uLLamE” as per thamizh grammatical format of “makara Iru viLi vEtRumai”. thoNdar seyum: thoNdar refers to srIman nArAyaNan’s devotees. Here it also means those who are controlled and triggered by senses yet who are always are at the lotus feet of srIman nArAyaNan. It can also mean those who are servants of srIman nArAyaNan. Hence, the phrase “thoNdar seyum” would point to all those devotees of srIman nArAyaNan who consider themselves as servants to their eternal master srIman nArAyaNan. pallAyiram pizhaigaL: This would mean “innumerable mistakes”. If we were to identify the reason for these mistakes, we can see that it is due to the body that is always constrained by three types of guNams viz., “sathva guNam”, “rajO guNam” and “thamO guNam”. These three trigger pure, anger/activities and sleep characters in a person. Due to the influence and interaction of these one commits innumerable mistakes daily without his conscience. “pizhai” would mean “pApam” or mistake. When a person commits a mistake within a split second, it would take thousands and thousands of brahmA years to wipe out the sin. It may be good to recall that 1 brahmA year is several trillion human years. Thus we can see that it is almost impossible to wipe out the effect of any small mistake of ours. The mistakes that are being referred here are : doing things that are condemned by sAsthras that includes torturing others, praising others, desiring someone else’s wife, usurping someone else’s wealth, telling lies and eating that are not supposed to be eaten. 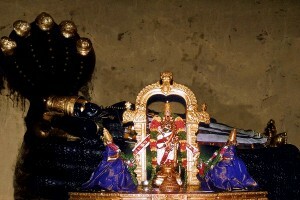 The other category of mistakes are not doing things that are prescribed by sAsthras that includes commiting apachAram (sins) towards perumAL which is comparing perumAL srIman nArAyaNan to inferior demi gods, finding unfounded faults in HIS incarnations, researching upon the items with which perumAL’s deity statue is being made, incomplete worships, stealing the items required for worship, either deliberately or stealthily, assisting someone who is stealing, getting those stolen products via either begging or by authoritativeness etc. When a person develops hatred towards fellow devotees because of materialistic pursuits, it is also counted towards these sins. iRai pArththirundhum kANum kaN: srIman nArAyaNan is the ONE who is present in everything and thus knows what is happening always. Such a supreme god srIman nArAyaNan, even though He does see these innumerable sins commited by HIS true devotees after their complete saraNAgathi, HE will act as if HE did not see anything. Here “kaN” would metaphorically mean knowledge. illAdhavan kAN: As we saw earlier that “kaN” denote knowledge, this would mean “ONE who does not have knowledge”. So perumAL srIman nArAyaNan would be in-cognizant of HIS devotee’s actions. The word “iRai” in the previous paragraph can also mean “a small amount”. So, when it is used in such a usage, it would mean that HE would not even know HIS devotees action not even a small amount or a single bit. This goes ahead to establish that HE will ignore their unconscious mistakes completely. This is also being reinforced in srI vishNu sahasra nAma sthOthram as “avigyAtha”. Hence the overall meaning of this pAsuram is that one does not have to fear for his actions, after saraNAgathi. The eternal master srIman nArAyaNan would not take cognizance of these actions/mistake as He would just ignore them.